This program consists of three 10-week trimesters, which can be taken as separate certificate courses, each earning 12hrs of continuing education/post-graduate credits. This ten week course will be a clinically focused study of Melanie Klein’s and Donald Winnicott’s contributions, as they are related to the personality and biographies of these two theorists. Those who participate in this 10-week seminar will have the unique opportunity to read chapters from Dr. Kavaler-Adler’s upcoming book, entitled Klein-Winnicott Dialectic: Transformative Metapsychology and Interactive Clinical Theory (Karnac, in press). This book illustrates the dialectic and integration of Kleininan and Winnicottian contributions to clinical work, in contrast to a long British tradition of polarizing them. Course participants will learn how various clinical and theoretical concepts of Winnicott (e.g., the object survival, transitional space, and mirroring) and of Klein (e.g., mourning and processing guilt and loss in the depressive position, as well as progressive levels of symbolization) work effectively together, particularly for cases of character disordered patients. Integrating Klein and Winnicott on a developmental and clinical basis is the essence of Dr. Kavaler-Adler’s own theory of “developmental mourning.” Her additional integration of contributions of Ronald Fairbairn, Wilfred Bion, Michael Balint, Althea Horner, Jeffrey Seinfeld, and Thomas Ogden, as well as others, allows the Klein-Winnicott dialectic perspective to come to full clinical fruition. The biographical stories of Melanie Klein and D. W. Winnicott will also be a part of the discussion, showing how any unique theorist emerges into theory through his/her own particular internal world, and how this internal world and its relationships are carried with anyone unconsciously and pre-consciously since infancy and early childhood. Clinical examples from the instructor and the class participants , as well as the role-plays will accompany each and every session of the course. During the role-plays, some of the participants will play the part of one of their own (troubling) patients, while Dr. Kavaler-Adler or another participant will be playing the part of a psychoanalyst. For more information about this course, please contact Dr. Kavaler-Adler, directly by email @ drkavaleradler@gmail.com or phone @ 212 674 5425. To Register, please follow the link HERE OR contact ORI administrator @ Admin@ORINYC.org or via phone - 646-522-1056. First Week Reading: Introduction section of the book. 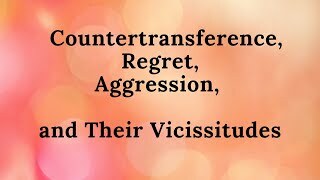 Discussion of the perspective of Melanie Klein’s and D. W. Winnicott’s works and theories as complementary for understanding one’s clinical work, rather than being seen as they historically have been, in polarized terms. A developmental theory is proposed, which employs fruitful theoretical dialectics between both theories - for an overall developmental object relations theory that can be readily appreciated in clinical work. Case vignettes and examples are offered in later chapters in the book. Second Week Reading: Chapter One: Melanie Klein Like Moses on the Way to the Promised Land: A case of Pathological Mourning. This chapter relates to Phyllis Grosskurth's unearthed letters of Melanie Klein and her mother and to Klein's personal biography. Derivations of Klein's theory of "Envy and Gratitude" and many other theoretical concepts can be seen evolving here. 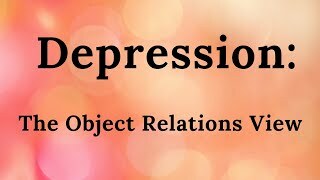 However, a main point is the blocked mourning in the theorist who first spoke of mourning as a critical clinical and developmental process, and who first spoke of aggression as part of the mourning process. The fascinating fact is that Melanie Klein, herself, remained stuck in a state of idealization towards her own mother that prevented her from integrating a split off aggressive "bad object" (Fairbairn, 1952) part of her (the internalized mother), so that her "death instinct metapsychology" emerged as a symbolic manifestation of her own unresolved mourning. One hypothesis is that the "death instinct" metapsychology is redundant to her clinical theory, and sometimes can be seen as compromising it, while other metapsychology about symbolization can be proposed to support the developmental insights of Klein's clinical theory. Other concepts in this chapter relate to oedipal trauma as opposed to oedipal romance, and how this overlies pre-oedipal arrest pathology. In the next chapter we see how this creates a demon lover theme in Klein's internal world and in her artistic expressions of that internal world. Third Week Reading: Chapter Two: Melanie Klein's Creative Writing, Revealing Themes in Her Life and Theorizing. Phyllis Grosskurth in her 1988 biography of Melanie Klein, can be seen to reveal "demon lover themes" that relate to Dr. Kavaler-Adler's writing on the demon lover theme and complex (Kavaler-Adler, 1993, 1996, 2000, 2003, & 2013). These demon lover themes are symptomatic of an underlying addiction to a masculinized aggressive mother figure, which becomes dominant in the psyche when the father is absent as any kind of counterbalancing figure for internalization, and when the brother's envy becomes a trenchant factor in the pathological power of this internal masculinized aggressive mother figure. The yearned for male muse, inspired by innate oedipal longings always turns into a rejecting male demon lover figure in Klein's psyche, as is true in the psyche of the majority of brilliant and well-known artists and writers written about by Dr. Kavaler-Adler in her earlier books on female creativity and development: The Compulsion to Create: Women Writers and Their Demon Lovers (1st ed. By Routledge 1993, 2nd ed. By ORI Academic Press, 2013) and The Creative Mystique: From Red Shoes Frenzy to Love and Creativity (Routledge, 1996, ORI Academic Press, 2014 –in press). Fourth Week Reading: Chapter 3: The Phenomenological Theory Stands On Its Own: Death Instinct as Demon Lover. This discussion will relate to how the entire metapsychological theory of the death instinct can be seen as a manifestation of Melanie Klein's internal world demon lover complex. The death instinct as a concept is proposed to be a reflection of an internal demon lover object, a visceral and mental enactment that can be seen to significantly color the theory that emerges as an abstraction of the internal world figure seen in Klein's creative writing, and which seems to have originated in her primal family experience. Fifth Week Reading: Chapter Four: Explicating and Utilizing the Phenomenological Theory. 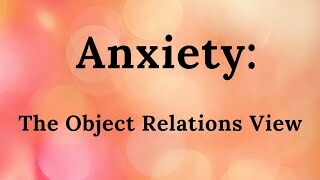 This discussion will focus on the power of Melanie Klein's theories of the paranoid-schizoid and the depressive positions, when seen in terms of anxieties, defenses, internal world fantasies and affects, which all have developmental meanings. When these phenomenological theories are viewed developmentally, they do not need the underpinning of a death instinct metapsychology, but rather them themselves to an independent clinical theory that has developmental progressions towards symbolization (also referred to as "mentalization") as a metapsychology for the clinical theory. Sixth Week Reading: Chapter Five: Developmental Evolution within the Theory of Melanie Klein. This discussion will be about expanding the developmental trajectories in Melanie Klein's theories. Varying theorists' theories will be seen to expand the developmental aspects of Melanie Klein's theories, including a Kleinian, Alexander, who relates to the disruption of mother/infant bonding being at the crux of arrests in development in the depressive position. Michael Balint's theories and those of Thomas Ogden will be seen enriching the developmental vision of Klein. Dr. Kavaler-Adler's own theories of "Developmental Mourning" and of "psychic regret" in the transformation of aggression will also be discussed. This thinking then leads into the developmental vision of D. W. Winnicott, whose theories, and their relation to Winnicott's biography, will be explicated in the next several chapters. Seventh Week Reading: Chapter Six: Developmental Evolution within the Works of Donald W. Winnicott: Psychic and Transitional Space. This discussion will focus on the biographical relevance of Winnicott's family history, and particularly in relation to his mother's mode of emotional withdrawals, dependence, and unavailability to his thinking about psychic and transitional space, and about the lack of psychic and transitional space. Rodman's biography on Winnicott will be cited in relation to Winnicott's own developmental experience and how it affected his theories. Then the dialectical relationship between Klein and Winnicott will be seen in relation to the whole developmental vision concerning the idea of internal psychic space and external transitional space, which needs to be created for separation-individuation and self-integration to take place. A clinical case vignette will from the chapter will be discussed. Eighth Week Reading: Chapter Seven: Dynamics of Transitional Space: Pathological Foreclosure vs. Expansion in Clinical Treatment. This discussion will focus on the combination of literary and clinical examples in this chapter of the developmental failings that cause a foreclosure in psychic and transitional space. The biography of Virginia Woolf, along with her literary writings, will be seen as an example of someone who had foreclosed psychic space that was never resolved. 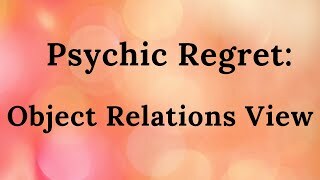 A clinical example will be offered to show how foreclosed psychic and transitional space can be resolved through object relations psychoanalytic treatment. Ninth Week Reading: Chapters Eight and Nine. Chapter Eight: D. W. Winnicott's Contribution to the Understanding of Mirroring as a Developmental Process: The Klein-Winnicott Dialectic Within. Chapter Nine: Narcissistic Mirroring As Perversion of Developmental Mourning. This discussion will focus on Winnicott's whole concept of "mirroring" as related to both health and pathology. Winnicott's view of mirroring, in terms of the mother or therapist as mirror, will be seen to interact with Kleinian thinking in a developmental dialectic. Also, the contrast will be seen of "mirroring" for healthy development in mother /child relations and for psychotherapy, versus mirroring as a narcissistic defense, due to impaired mirroring in childhood. Tenth Week Reading: Chapter Ten: Loneliness in Dialectic with Solitude and brief book Conclusion. In this chapter, Melanie Klein's views on "Loneliness," seen in a paper on that topic, will be viewed in dialectic relationship to D. W. Winnicott's views on "Solitude." Through Winnicott's paper on "The Capacity to be Alone" we understand how a state of loneliness can become a state of solitude in which creative self-expression can thrive, which is particularly relevant to artists and writers, but in fact to us all. Clinical examples will be cited and discussed. The book's summarizing conclusion will be discussed. Website created by MindMendMedia (last updated on 03/13/2014).